Wellness gift certificates make the perfect gift for that special someone who needs some stress relief. Rest assure that your purchase is secure as your transaction will be provided by PayPal. You will receive a confirmation email from PayPal once the transaction has been processed, and we will contact you as soon as we receive your payment. We will mail you the gift certificate, however, if you would like us to mail the gift certificate to the recipient please type their address in the "special instructions" section. Please note all sessions with Rashael are an additional $15. Any questions please call us at (727) 785-7071. Purchase Your Wellness Gift Certificate Today! Multiple Selections may be purchased at the same time by clicking on the "Continue Shopping" button. If you would like to give the dollar amount please specify in the "special instructions" section, then the recipient can determine how they want to spend it! 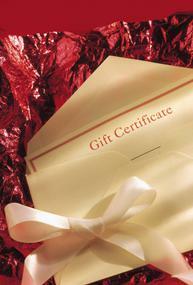 Gift Certificates are available for most of our services and packages, as well as in any dollar amount. You can purchase a Gift Certificate, in person, on our website or via phone using a credit card. Gift Certificates are non-refundable. If there is a price increase for the service, the client is responsible for the remaining balance.